The number one most-common health concern in the U.S. is the common cold, closely followed by tooth decay—a highly preventable condition. Sadly, cavities affect more than 40 percent of young children and approximately 66 percent of teens. The incidence of tooth decay among the younger population has expanded over the last decade, despite a fall in rates among the general population. In an effort to combat these outcomes, the American Dental Association (ADA) has deemed February as National Children’s Dental Health Month (NCDHM). NCDHM is a program designed to raise awareness about the importance of dental care among children all year long. Begun in 1941 as a recognized day, the program expanded in 1981 to a month-long awareness campaign celebrated every February. The ADA hopes their message will resonate with parents and children all year long. Previous programs have brought awareness of the importance of proper dental care to millions of American communities. The ADA began the NCDHM to help parents, teachers, and dental care professionals promote proper dental care to children, creating friendly characters, engaging activities, and exciting events. They provide online resources, including planning guides, booklets, videos, and other materials to assist with dental health presentations. Education and awareness must begin early to ensure that children learn and maintain good dental care habits. 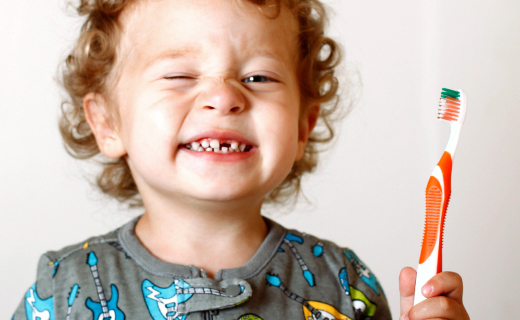 Parents should teach their children proper dental care habits before their first tooth has emerged. This includes correct brushing techniques, flossing, and scheduling twice-yearly visits with family dentistry experts. The NCDHM’s 2014 campaign centers on the slogan, “Join the super smile team.” The McGrinn twins are this year’s characters. Flossy and Bucky McGrinn, their dog, K-9, and their faithful friends, Den and Gen Smiley are featured. These superheroes of dental hygiene fight together for a winning smile. In 2003, the ADA began the Give Kids a Smile program to help dentistry professionals reach out and offer dental services to underprivileged children in their communities. Dentists and other oral health teams dedicated to children’s health volunteer their time and services to young children who would not otherwise receive screenings, dental care treatments, and oral hygiene education. Give Kids a Smile Day began as a single-day event during the month of February, but today it has become a year-round event, serving cities nationwide. Every year, the program is a part of more than 1500 events in the U.S. managed by 40,000 volunteers who serve more than 450,000 children. All around service, friendliness and consideration of both hygienist and dentist and the knowledge. Nice and friendly staff Teeth cleaned and flossed well Doctors expertise as well as dental hygienist knowledge. Always has good availability…makes a root canal painless…very nice dentist and friendly staff….all around great office for dental health.